An interactive tool for the amateur photographer, Flikcr creates a whole new playground for both beginners and experts on digital photo storage. Flickr, created by Yahoo presents a home for photographers of all skill levels to post their photos in a community forum. Flickr is based off of the idea of sharing, and allowing others to access photos. While privacy settings allow some posters to restrict access to their photos, Flick “recommends” allowing anyone to access your photos. The photo site runs off of a series of “tags,” which run on the same concept of “tagging” for any other site and allow users to quickly sift through several thousands of photos in a matter of seconds. By searching for tags on the site, only relevant or “tagged” photos show up on your searches, including people and places. A global map allows users to put tags on places within feet of their photos, allowing users to search photos by city and region as well. For archiving purposes, this allows a unique way of storing and filing photos, separating them into various sorts of categories. Sure, it’s convenient for some users, but it also raises the question: what if things are tagged wrong? It might not be a national crisis, but still, users make mistakes, right? I spent some quality time on Flickr over the course of the week, and explored all of its different functions. While setting up an account is a little confusing, the general idea of the site is genius. True, I would like a little more space for my photos (you’re restricted to just 200 MB on your individual photos), but creating multiple accounts can circumvent that. Although previously restricting Flickr access to solely Yahoo users, Google and Facebook users have now been invited access to Flickr, competing with Google’s Picasa. After playing around with the site, I’ve really got to compliment Flickr for making the site as easy to use as possible. As a newspaper photographer, I have an opportunity to label my photos with titles, add captions, and tag them as many times as I want. Using photos from my archives, I grabbed a bunch of photos from my old high school’s sports and plotted the events at the different locations as well. Now, when users are exploring Manchester, my photos will be included. This presents interesting opportunities for historians and digital archivists. Because the photos are on a free platform with the ability to be tagged several times, historians have the ability to load photos to the site of important historical happenings—its an easy way to keep track of as many important free-domain photos as possible and a site I would definitely recommend going to check out, whether you’re an amateur or expert photographer. As Bonnie’s post below adroitly demonstrates, Wikipedia is a site with a deeply-ingrained ethos and traditions that might not be familiar to the casual user, a tribal society that debates the content of pages hidden behind talk pages that regular users rarely see, and end up producing articles that are more dependent on consensus than on expertise. Sometimes, the pages that result are admirable, written in clear English and with a large number of citations at the end for further scholarly pursuit. Often, these are prominent subjects with quality articles in many of Wikipedia’s innumerable language versions (including the admirable but somewhat bizarre “Simple English” Wikipedia, which tries to present topics like quantum mechanics at a sixth grade reading level). Since this practicum called on me to analyze three pages on Wikipedia, I decided to present them in a classic format: the good, the bad, and the ugly. I found one article on Wikipedia I found especially praiseworthy, one that was stunningly poor, and a talk page that was, to put it mildly, ugly. Without further hesitation or preamble, let us examine Wikipedia. How can you tell what the best articles on Wikipedia are? Wikipedia itself has a handy answer: they have a “Featured Articles” category that lists what the site considers the best articles on the site. There are currently over 3,100 featured articles, and they add roughly one a day. These articles are Wikipedia’s self-proclaimed cream of the cream, the roughly .1% of its over three and a half million articles that it’s willing to say it stands by. Indeed, the Featured Article I have chosen is an admirable encyclopedia article. Slavery in Ancient Greece has sections analyzing every aspect of slavery, from a detailed examination of the various terms the Greeks used for slavery and their different connotations to an examination at the origins of Greek slavery from the Mycenaean age through the Homeric period, tracing references of slaves in pre-Classical Greece all the way down through Draco and Solon. The article struggles to quantify the number of slaves in Classical Greece, arguing that though the wide-scale slavery of the Romans in terms of number of slaves per master was unknown, there was a widespread usage of slaves in most classes, and a rich man could have up to fifty slaves. It argues that intentional slave breeding was a rare, if not unknown, phenomenon, and that the “slave/citizen” line was far blurrier than the strict separation of the antebellum American South. It goes on to detail classical views of slavery and then, amazingly, gives a short modern historiography of the subject and even poses discussion questions. This admirable article is followed by a lengthy list of twenty-nine sources, 170 endnotes, and fifteen books for further reading. This article’s ending list of sources would be ideal for an undergraduate writing a paper on Ancient Greek slavery and needing academic sources: an amazing amount of historiography is present in the works listed (though, admittedly, 1/3rd of the books mentioned are in French). All in all, this article is a great example of what a Wikipedia page can offer scholars. At the other end of the spectrum, we find Wikipedia’s article on the 19th century Taiping general Loyal Prince Lee, or, as he’s known on Wikipedia, Li Xiucheng. I will admit that this is the third occasion on which I have cited this page as an example of Wikipedia’s defects, and it has changed every time, except no matter how much it changes, it remains unacceptable, year after year. Wikipedia put up a disclaimer, almost apologetically, saying that “This article is a rough translation from Chinese. It may have been generated by a computer or by a translator without dual proficiency. Please help to enhance the translation.” Now, read that quote back over. The translation was generated by a computer or a translator without dual proficiency. It’s no wonder the article is a shambles, an incomprehensible mishmash. The level of incomprehensibility is best demonstrated by the section labeled “Write:” “In Zhong Prince Li Xiucheng Describes Himself (《忠王李秀成自述》), the autobiographical account of a prince of the Heavenly Kingdom written shortly before his execution(Pseudohistory saying Li was suicide admitted by Zeng Guofan gave Li a sword because Zeng respected Li, even Li Hongzhang had been read this describes and praised Li Xiucheng was a hero on a letter to Zeng).” Is this at all comprehensible to anyone? The faults are further demonstrated in the final section which gives the name of a professor at the University of London as “柯文南.” One must be skeptical that that is, in fact, how he prefers his name to be rendered in English. In a final confusing move, under children it lists a son, “Li Ronfar Battle of Shanghai (1861).” Did he die in the Battle of Shanghai? Was he born in the battle of Shanghai? What does this mean? The Loyal Prince Lee article demonstrates a major shortcoming of Wikipedia: articles featuring figures that are mainly of interest to speakers of non-English tongues can be extraordinarily poor, even if their article on the Wikipedia of the native language is fine or even exceptional. Most of Wikipedia’s deliberations happen behind the scenes, on its talk pages. Talk pages are attached to every article, yet are rarely seen by most casual users (many do not even notice them), leading to talk page conversations usually dominated by hard-core Wikipedians or cranks (and the two categories often overlap). Many articles are subject to perennial flame wars: whether Wikipedia’s trickster sister Encyclopedia Dramatica deserves an article (warning: the author of this post strongly encourages you not to visit Encyclopedia Dramatica), whether a formerly-German, now-Polish city on the Baltic should have its name rendered “Danzig” or “Gdansk” and whether its most famous inhabitant, Nicolaus Copernicus, should be a “Pole” or a “German” (a distinction Copernicus would not have understood). Yet many of the most contentious flame wars are on subjects that one would not expect: race in antiquity. See the talk page of the Ancient Egyptian Race Controversy page. For over a century, there has been vigorous academic debate on the subject, and the popular debate on Wikipedia makes that academic debate look positively civilized by comparison. The page comes with an astounding twenty-three archives of discussion and warnings telling you that the Arbitration Committee has placed the article under probation, that the subject is controversial and in dispute, that the article had been Wikipedia peer reviewed (such a thing does, in fact, exist), that the page survived a vote on deletion, and, amusingly enough, a little dove image telling the user to remember etiquette. The article’s first archive alone is enough to give one a major headache, and the implication that there are twenty-two more spanning half a decade of running argument boggles the mind. That this much discussion hides in the shadow of a relatively modest article shows both how much work goes into Wikipedia and how much controversy the past can create even after a gap of two and a half millennia. Wikipedia shows that history is alive and well on the Internet, still arousing passions and still leading to ferocious debates. It does, however, demonstrate that not all articles are created equally, and that one should not presume that your average Wikipedia article is of equal caliber to the ones with that tell-tale star, and that maybe, just maybe, one should look at the talk page before accepting the article’s contents as truth. Is Wikipedia a good reliable source of historical scholarship? The answer to this question depends upon several factors including, but not limited to our own relationship to historical scholarship. According to Roy Rosenzweig, “History is a deeply individualistic craft” and its scholarship is characterized by the possessive individualism of historians. As historians we are taught to cite our sources, giving credit to other historians for the use of their ideas and words to avoid charges of plagiarism. In contrast, Wikipedia encourages the creation of entries in cooperation with multiple authors, who may be anonymous. Wikipedia allows users to freely copy and use the entries found on their site in a variety of ways. Teachers can make copies to use in their classes, students can copy and use the articles in their papers, authors can use the information in books, and anyone with a website can copy information found on Wikipedia to their website. The only restriction imposed by Wikipedia regarding the use of these entries is…”you may not impose any more restrictions on subsequent readers and users than have been imposed on you”. Wikipedia is a free, open, collaborative source which first appeared on the World Wide Web in January 2001. The idea behind Wikipedia was originally developed in 1999 by Richard Stallman who proposed a website called GNUpedia. The following year Jimmy “Jimbo” Wales and Larry Sanger, the driving forces behind Wikipedia, developed and launched Wikipedia’s predecessor – Nupedia in March 2000. This was followed quickly by Wikipedia in January 2001. The WikiWikiWeb software which enabled the creation of Wikipedia was developed in the mid 1990’s by Ward Cunningham. Since its premier Wikipedia has become the largest, most widely read and most important free historical source. Wikipedia has its own set of rules which are intended to regulate participation, however the co-creator and the site’s editor-in-chief, Larry Sanger resigned in 2003 in response to the projects “tolerance of problem participants and its hostility toward experts”. Wikipedia has its own set of policies and guidelines, which are “policed” by both volunteers as well as The Wikipedia Foundation. The Wikipedia Foundation consists of five members including Wales, two of his business partners and two elected members who retain the power to “ban users” from the website. 1. Wikipedia is an encyclopedia and therefore personal essays, dictionary entries, critical reviews, propaganda, advocacy and original research are excluded. Basically, Wikipedia wants the accepted history summarized on the site and discourages anyone, especially historians from breaking new ground with original research. 2. Avoid bias – All entries must be void of any bias effectively remaining neutral on all subjects – especially volatile ones. Rosenzweig compares Wikipedia’s “founding myth” of neutrality with Peter Novak’s “founding myth” of the historical profession, “objectivity”. Is Wikipedia a good, reliable resource for historical scholarship? This question keeps resurfacing and for good reason. Wikipedia is first and foremost an encyclopedia and therefore is not a good, reliable resource for any student beyond middle school. Like other encyclopedias the information contained within the entries is limited with a neutral point of view and therefore void of opinion. Unlike traditional encyclopedias, Wikipedia is a white board site which enables readers to edit the information contained within any entry. The collaborative writing style encouraged by Wikipedia increases the possibility that Wikipedia entries could be altered at any given time, a characteristic which prevents its use as a reliable source of historical scholarship. 1. It was new technology and they did not trust the information. I have been teaching history at a community college since last spring and in my syllabus under instructions for research papers I tell my students, Wikipedia is not an acceptable source for your paper. My primary reasons for this are that Wikipedia is an encyclopedia and the collaborative nature of the site which potentially results in changing and/or inaccurate information. Roy Rosenzweig leaves us with an idea, a challenge in regard to Wikipedia’s popular history. It is his tentative belief that “If Wikipedia is becoming the family encyclopedia for the twenty-first century, historians probably have a professional obligation to make it as good as possible”. He challenges historians to devote one day to review and improve those entries which cover their area of expertise. Participating in this project would enhance the quality of Wikipedia. 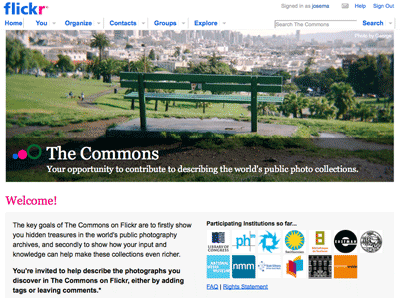 In January 2008, Flickr: The Commons was created with the intention to create the world’s first public photo collection and interactive archive. Users are able to browse the image collections of 46 participating institutions from around the world, including collections from notable American institutions: The Library of Congress, Smithsonian Institution, National Media Museum, The U.S. National Archives, and NASA on the Commons. The Flickr format enables institutions to share limited photographic collections (those with no known copyright restrictions) with the general public. NASA, for example, which has been proudly “on the forefront within the federal government in utilizing Web 2.0 technologies” joined Flickr in 2009 to ensure that NASA images and media could reach an even wider audience. The Commons encourages site visitors and users to add tags or comment on the photos to encourage conversation and invite insightful dialogue to complement and enrich the collections. The comment feature allows knowledgeable users to share information, stories, and otherwise provide historical context. What is good for the user is also good for the institution? An article in the March 2008 edition of the The Library of Congress Information Bulletin entitled “Rediscovering Lincoln” triumphantly announced that thanks to “collective intelligence” the Library of Congress was able to properly identify a photograph and, subsequently, three glass negatives of Abraham Lincoln’s inauguration that had been wrongly identified as either the Grand Review of the Armies or the inauguration of Ulysses S. Grant. The potential for amateur historians and historians alike to properly identity photos and uncover “new” visual sources is a truly exciting prospect. For Flickr, and other crowd-sourced projects, the power is with the people. If you want to take one thing away from “Living and Learning with New Media” is just how far reality has passed research. If this paper is truly representative of the research on childhood and the internet, then not only have researchers only barely begun to scrape the surface, but that the language they are using to formulate their studies are hopelessly out of date. For all of that, I ultimately took away an optimistic message. Mimi Ito et al. set out to study how children play, self-actualize and learn in a digital environment. The key message is that children pick up surprisingly sophisticated knowledge online in the process of networking with friends and peer groups. The study included students involved in social gaming like MMORPGs and first person shooters, youths creating AMVs (adding music soundtracks to anime clips) and people creating fan dubs and subs (translating foreign films, usually anime). In each case, youths acquired highly sophisticated knowledge about video editing, and computer usage through peer interaction. They developed and carefully maintained online personae which allowed them to talk, socialize and even flirt in a secure environment. There conclusions are actually quite optimistic. It suggests that children are well aware of themselves and their activities online. The goal of parents and adults should not be to restrict or police the internet activity of children, but rather, to moderate it as fellow peers. Schools, they suggest, would do well to emulate the networked nature of the digital learning environment with student driven, peer moderated learning, relying on the sophistication students have already developed as part of their socializing to access, synthesize and learn knew knowledge. As I was reading this, I was amazed at how much it sounded like me as a teenager on the internet 15 years ago. All of these practices referred to in the study were things I participated in. 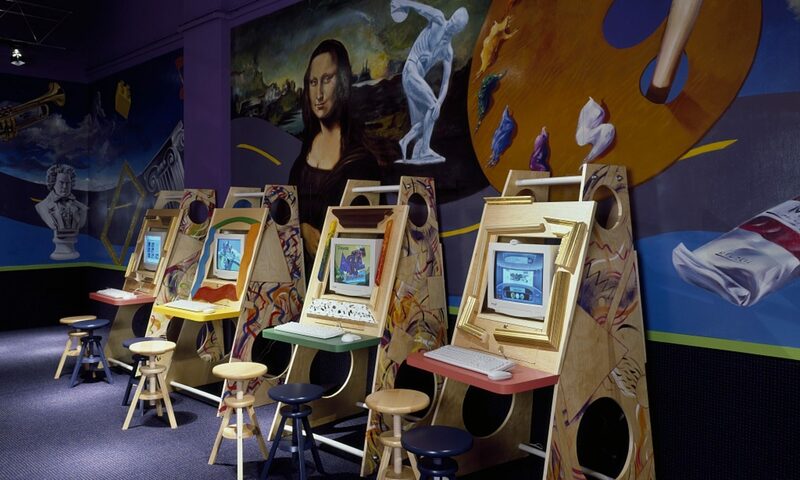 My brother at 14, taught himself first how to create maps in Doom, then learned Photoshop, then 3d Studio Max and now works as a 3d artist for Blizzard Entertainment, all through knowledge gained online through peer interaction. Granted this was over dial-up connections playing Quakeworld, or on Web 1.0 newsgroups, but there seems no fundamental difference. This suggests to me two things. First, despite changes in technology, the methodology of digital networking has not changed. Perhaps we’ve reached the end of the digital revolution. If that is the case, this study is even more behind the reality than its creators may realize. One example of how behind the curve Ito and the rest are is in their choice of language. For instance, they refer to socializing online as “hanging out.” I found this to be problematic at best. Internet socialization is far from hanging out. For me, “hanging out” is an activity. As a kid, when I used that term, it referred to actually going somewhere, actually investing time in being physically with friends. Online time with friends is usually carried out in a different manner. Being on IM is an activity that increasingly is part of the background of usual activity. For instance, chatting with a friend through Facebook while reading this article (bad admission? ), or dropping by a forum to post while hunting through JSTOR for an article. Reflecting, this is not fundamentally different from how I interacted on the web 15 years ago. Did anyone else get the impression that the researchers are looking in at a playground that many of us are already inside? Is this crisis of a generational digital divide really worth the ink and web-space devoted to it? Or is this merely a phenomenon of this particular generation of researchers commenting on this particular generation of kids? Will academia evolve toward a more web-centric approach to learning as web-centric learners step in the fill the gap, or will institutional inertia prevent what is happening naturally across the country?